In the modern basilica of St Peter’s in Rome, the high altar is at the west end. The same was true of the basilica built in the 4th century by Constantine. By the south door of the basilica stood two large round buildings, which ran in a line west-east. 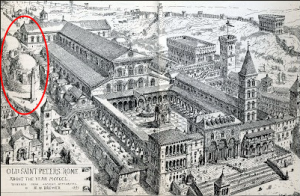 The western-most of these was demolished as part of the construction of the new basilica, but the other stood until the 18th century, when it too was demolished. It is sometimes known as the Vatican rotunda. To the east of them both, on the same line, stood the Vatican obelisk. This item from ancient Egypt now stands in the piazza before St Peter’s. Another image of the Vatican rotunda has reached me. This time it appears in a painting by Giorgio Vasari (d. 1574), “Pope Paul III Farnese directing the continuance of St Peter’s”, available here. 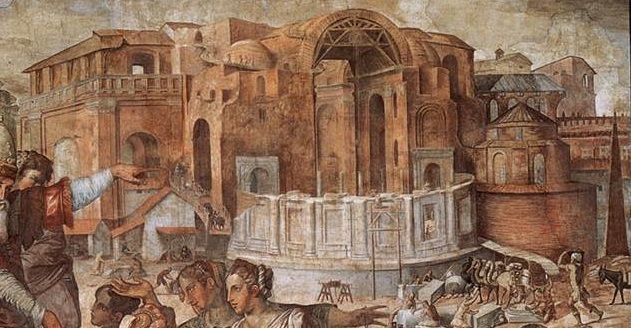 A detail of this shows the new basilica under construction, the Vatican rotunda to the right, and the obelisk (surely in the wrong place?) beyond it. The rotunda was clearly not a particularly attractive building. It looks as if it was a vast circular building, on top of which a structure with windows had been constructed. One reason why the rotunda was so simple is that it was probably, originally, a massive, circular 3rd century Roman tomb. The land around it was raised by Constantine’s architects, in order to provide a platform for the basilica; and the obelisk ended up with its lower section underground. The archaeology clearly indicates that a circular building was constructed on this site in the early 3rd century, in the Severan period. It is not quite clear whether the rotunda is the same building, or a replacement on the same site at a somewhat higher level. The obelisk stood on the spina of the Circus of Gaius and Nero. The presence of tombs on the same site indicates that the circus had gone out of use in the same period, as the Vatican cemetery spread down the hill towards it. The archaeology is not as clear as might be desired, because the site can only be excavated with small pit trenches. So there is much uncertainty in all this.